Boarding and departure times may vary - your cruise confirmation will contain different actual times if changes apply. Please call if you have questions about cruise availability for a given date and time. Please note that the Monte Carlo casino cruise HAS BEEN discontinued as of June 15, 2007. 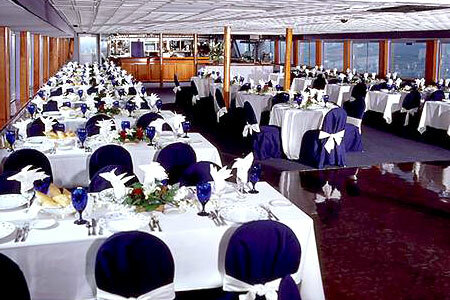 In it's place we will are offering the Supper Club Dinner Cruise!!! Enjoy a 2 1/2-hour cruise on the SF bay and gaze upon a glorious sunset on the Pacific Ocean while enjoying a festive buffet and views of the Golden Gate bridge. The Monte Carlo Casino Cruise is the place where you'll cut loose with laser karaoke sing-a-long, dancing and just for fun casino-style gaming. 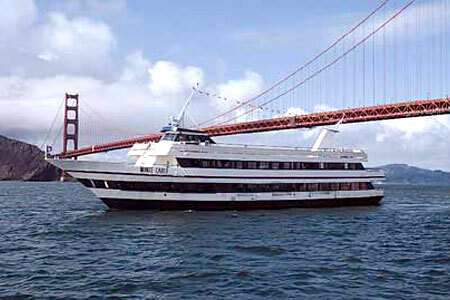 A perfect way to experience a Bay Cruise on San Francisco Bay! 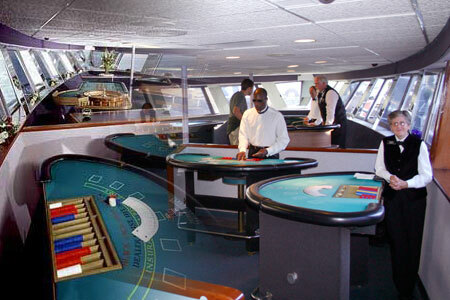 Optional Casino Style gaming is available onboard for an additional $10.00 per guest. 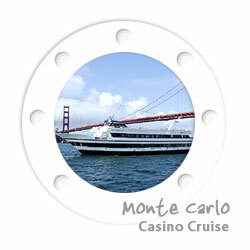 Visit our San Francisco Casino Cruise Enhancements page for details on Monte Carlo Casino packages, and bar packages. Lunch, Brunch or Moonlight Cruises: We recommend business casual attire, such as khaki pants and collared shirts. No jeans, shorts or tank tops will be allowed. Dinner Cruises: Business casual attire is requested. No jeans, shorts or tank tops will be allowed. Reservations can be made online or by phone at (877) 563-8368 with a major credit card. Seats are not held without payment. The preferred method of payment is by credit card. We accept Visa, MasterCard, American Express, and Diners Club. You can pay with a personal check or money order by mail. Please call (877) 563-8368 for details. Can I hold a reservation and pay onboard? We do not hold reservations without payment. See "What payment options do I have?" for information on payment options. I have a gift certificate/ coupon / offer, how do I redeem it? Please bring your gift certificate, promotional card or coupon and present it to the host/hostess on board. Also, because these are considered forms of payment, they must be mentioned at the time of booking to receive any discount. No tickets will be issued or sent. When you arrive, introduce yourself to the Host/Hostess and they will show you to your table. Be sure to get a confirmation number at time of booking. Where is the best place to park? Does you validate parking? Yes, gratuity and tax have already been included in all cruise prices. Our cruise sails rain or shine. In the case of severe weather conditions or upon the direction of the U.S. Coast Guard, we will remain dockside. Our cruise offers inviting dance floors and a variety of music - from the dance hits of the 40's through today as well as a variety of jazz, standards and popular favorites. Our cruise's firm cancellation policy states that "all sales are final and non-refundable". However, with a 48 hour or better notice, we will be happy to reschedule your cruise date or issue the funds in the form of a Gift Certificate. Reservations canceled or rescheduled will be charged a $25.00 per person cancellation fee. Do you offer special celebrations for birthdays, anniversaries or special occasions? We offer a Celebration Package for an additional charge that includes; champagne, guaranteed window seating, chocolate truffles for two and souvenir champagne flutes. Click on this link to view all of our Celebration Package options. Please make mention of this when booking your reservation for groups of 19 or less. What décor does your cruise provide? All of our yachts are decorated with white linens, brass lantern centerpieces, silver and china. Cakes that do not require refrigeration may be brought on board. You will be charged a $1.50 per person cake cutting fee. Small flower bouquets are allowed. Yes, vegetarian meals are available and can be arranged at the time of booking. If you have a group with many vegetarians or if you have vegans please notify a sales representative at the time of booking. There are no age restrictions for any of our Lunch, Brunch, Dinner or Monte Carlo cruises. Please call with questions about any of our special event cruises. Children under 4 are complimentary. Children 4 to 12 are 40 - 50% off, depending on cruise type and port location. Please call (415) 383-1052 to discuss local port options. Each vessel is 100% Coast Guard certified with life preservers and all required life saving equipment, including child life vests. Our cruise does not have phones for guests' use. Most cellular services are available on the water as we do not cruise beyond one mile off shore. Yes. Guests are welcome to come and meet the captain and his first mate. Dinner service begins immediately upon disembarking. No, you do not need to pre-select your menu. We have a menu that you will chose from onboard. ++ Prices for cruise are per guest (and are inclusive of tax, gratuity, port fees and landing fees), and are effective for regularly scheduled, Non Premium date Dinner Dance cruises with departure dates from June 1st, 2011 - March 31st, 2012; any cruises with a departure date after March 31st, 2012 will be subject to increased rates. Quoted rates are not available for Holiday and Special Event Dates (these are Premium Dates, and have special Premium Rates package pricing, noted elsewhere on this site, or obtained by calling our office), including Valentine's Day and weekend (February 11, 12, 13 & 14, 2012), KFOG KaBoom, Fourth of July (July 4, 2011), Thanksgiving Day (November 24, 2011),Christmas Eve (December 24, 2011), Christmas Day (December 25, 2011) and New Year's Eve (December 31, 2011), Special December Holiday Buffet Dinner Cruises.